#stampinup #onstage2016 One of the best things about Stampin' Up events is meeting new stampers and making new friends. At this year's OnStage Live event in Salt Lake City, I met a fun new friend: Lisa Coxon-Fenewald. We met at Lydia Fiedler's pre-event Understand Blue stamping retreat and then had dinner together and sat together during Stampin' Up presentation. Lisa was so sweet to give me one of her swap cards even though I didn't have any of my own. (All mine were committed to the black and white and one color swap.) I love Lisa's card it's so soft and subtle! Next, Lisa stamped the marine images from the "By the Tide" stamp set (retiring) in Calypso Coral onto Very Vanilla panels. She added some splatters from the "Gorgeous Grunge" set in Tip Top Taupe--some splatters are stamped full-strength, while others are stamped off once. She stamped the round medallion in Calypso Coral and punched it out with the 1/2" Circle Punch and adhered it to the card with a Stampin' Dimensional. Lisa used a sentiment from the "Butterfly Basics" stamp set, stamped in Tip Top Taupe. She also used Tip Top Taupe to stamp the script from the "By the Tide" set on the third panel. I think the favorite part of the card is the nautical knot Lisa tied in Very Vanilla Thick Baker's Twine on the middle panel. That's a stroke of genius!! Lisa adhered all three panels to a Tip Top Taupe card base. This card is gorgeous and I'm so glad Lisa gave it to me!! The artist used the Butterflies Thinlits to create the butterfly on the top of this card, using Tangerine Tango and Basic Black Card Stock. She unraveled one of the twisted twines from the Baker's Twine Combo Pack (retiring) to get two Basic Black pieces to make the antennae. 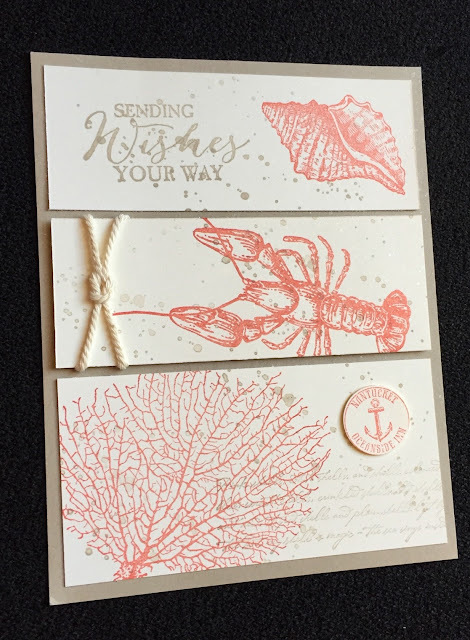 The lower part of the card was made by inking the raised side of the Fluttering Embossing Folder with Tangerine Tango ink and running it through the Big Shot with some Whisper White Card Stock. 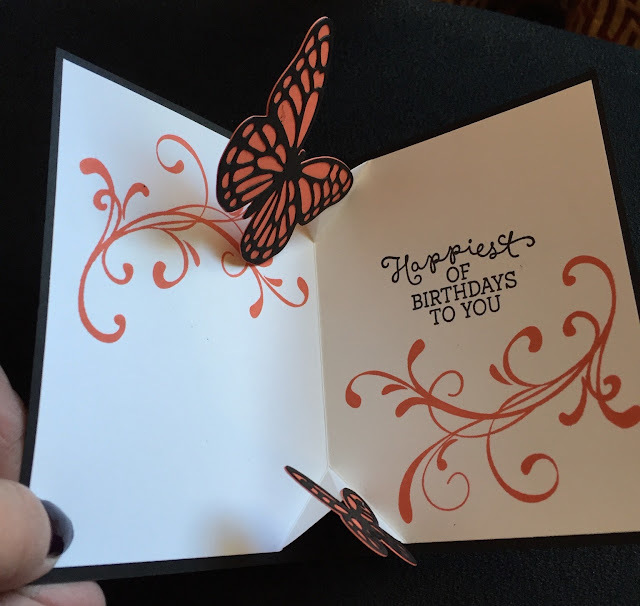 The body of the butterflies are hand-drawn with a Basic Black Stampin' Write Marker. The artist adhered a Whisper White upper panel and the embossed panel to a Basic Black mat and tied on a length of Basic Black Stitched Satin Ribbon (retiring) before adhering everything to a Tangerine Tango mat and then onto a Basic Black card base. Lots of layering here!! But wait until you see the inside of the card!! All images copyright Stampin' Up. Look at this amazing pop-up on the inside of the card! The artist used a 4-1/8" by 5-3/8" piece of Whisper White Card stock, scored in the middle to make the "platforms" for the popped-up butterflies. She stamped the swirl from the "Everything Eleanor" (retiring) set in Tangerine Tango on both sides of the card and a sentiment from the "Birthday Blooms" stamp set in Basic Black Archival Ink. 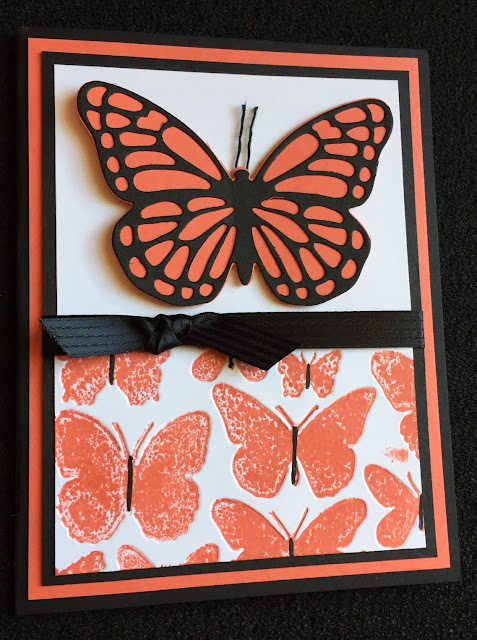 She used the Butterfly Thinlits again to make the large and small butterfly from Tangerine Tango and Basic Black card stock. Isn't this card awesome!! 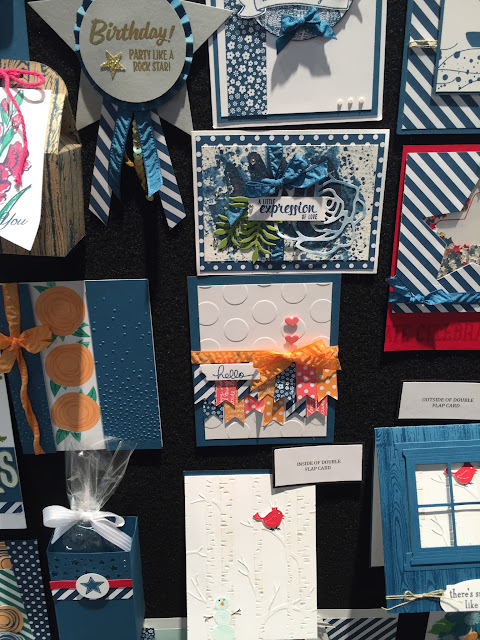 #stampinup #onstage2016 My third swap card share features the Everyday Chic Designer Series Paper that I love and that is retiring--get it before it sells out!! The artist adhered the square to a Whisper White mat onto which she had stamped a sentiment from the "Sheltering Tree" set in Basic Black Archival Ink. She tied on a a bow of Whisper White Satin Ribbon before adhering this to a Basic Black card base. This card is super adorable and would be quick and easy to make a stack of cards--with various sentiments from the "Sheltering Tree" set. And it's a great way to use up those DSP scraps that we all hate to throw away! #stampinup #onstage2016 Today I'm sharing with you another awesome card I received in the black and white plus one color swap I participated in while I was in Salt Lake City attending the OnStage Live event. This card was created by one of my favorite stampers: Barbara Welch. Barbara is famous (to me at least) for her vintage, shabby chic style. She started by stamping an image from the "Friendly Wishes" stamp set in Basic Black Archival Ink onto a Whisper White panel. She adhered this to a Basic Black mat. She stamped the same sentiment in Basic Black Archival Ink onto a Blushing Bride scrap and then fussy cut part of it before adhering it to the main image. She colored in part of the image with a Blushing Bride Stampin' Write Marker. 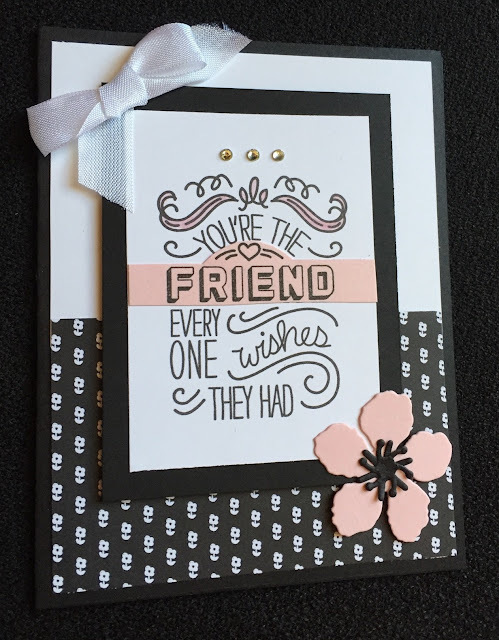 Barbara build her card by adding a Whisper White mat to the top half of a Basic Black card base and a floral piece of Everyday Chic Designer Series Paper (retiring) to the bottom half. 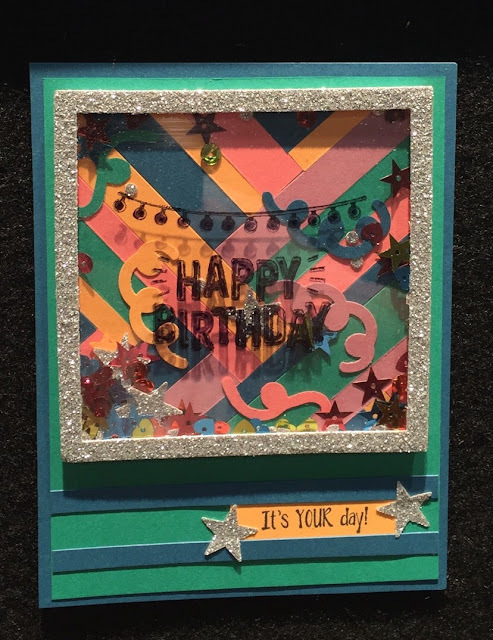 She adhered her matted sentiment piece to the card using Stampin' Dimensionals. To finish her card, Barbara cut a Blushing Bride flower using the Botanicals Builders Framelits. 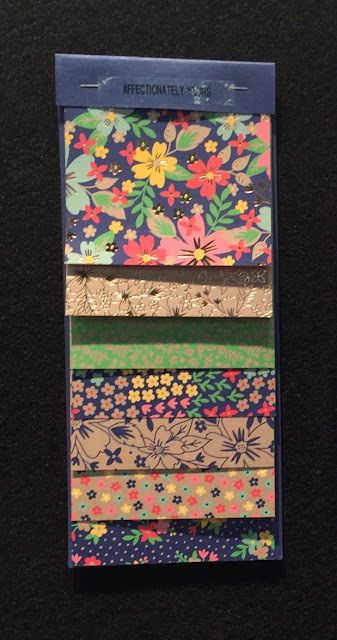 She used another framelit from this collection to add a Basic Black Card Stock stamen to her flower. Adorable! She added three Basic Rhinestones to the card for some bling and adhered a bow made from Whisper White Seam Binding Ribbon (retiring). I was so excited to see that Barbara was in the swap with me because I simply adore her cards!! #stampinup #onstage2016 Whenever I got to Stampin' Up events, one of the most fun things to do is to swap cards with other stampers. 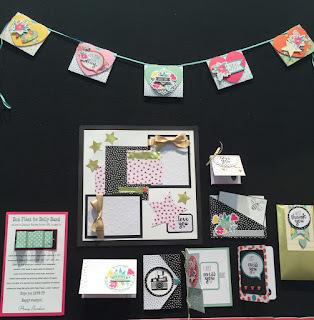 It's a great way to meet new stamping friends and it's a great way to collect new ideas for my own card making. It's also a good way to collect ideas for stamp sets I don't own, so I can show my customers different stamp sets "in action." 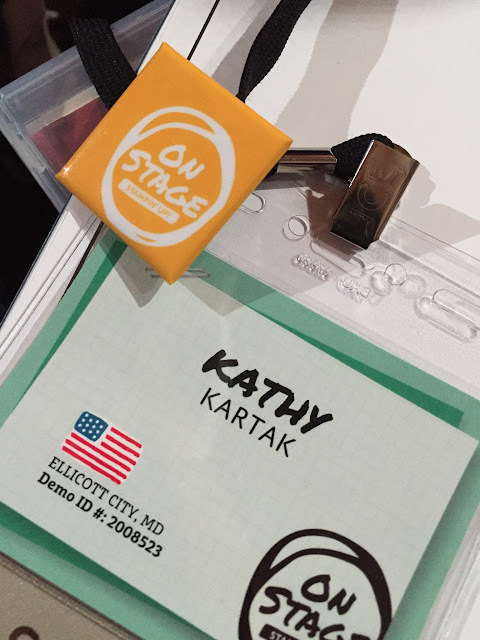 At this year's OnStage Live event in Salt Lake City, I only participated in one organized swap. The new catalog is about to come out and products are about to retire. (You can see the retiring list here--get 'em while they're hot. Retiring items are only available while suplies last!) I didn't want to get a bunch of swap cards with retiring products. So...only one swap. It was an awesome swap--black and white and one color. I'm sharing my favorites with you this week on the blog! I love this card for the subtle pop of color. 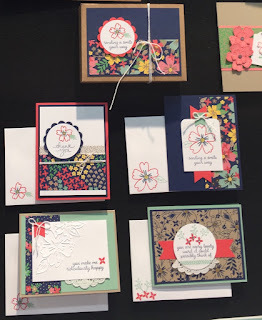 The artist, I think it was Laura Fernsler (I sent everything home already and don't have these cards with me right now), punched ten flowers using the Petite Petals Punch and ten flowers using the flower stamp from the Itty Bitty Punch Pack (retiring). She adhered these in a grid onto a Basic Black card base and added a Basic Rhinestone in the center of each. She also punched one Petite Petals flower and one Itty Bitty Punch Pack flower in Soft Sky. For the sentiment, the artist stamped the banner from the "Number of Years" stamp set and a sentiment from the "Cottage Greetings" stamp set in Basic Black onto a Whisper White scrap and cut them out using one of the Large Numbers Framelits Dies, that coordinate with the "Number of Years" set. 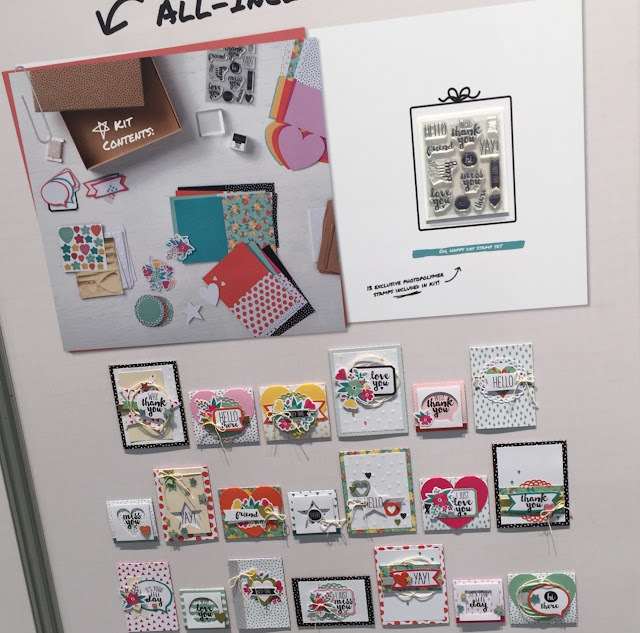 #stampinup #onstage2016 OK, so you may have heard by now that Stampin' Up revealed its new catalog during last week's OnStage Live event in Salt Lake City. I can't share it with you quite yet, but I can share some of the new product suites that we were shown during the on stage presentations and on the product display boards. I have two favorite product suites that I want to share with you. 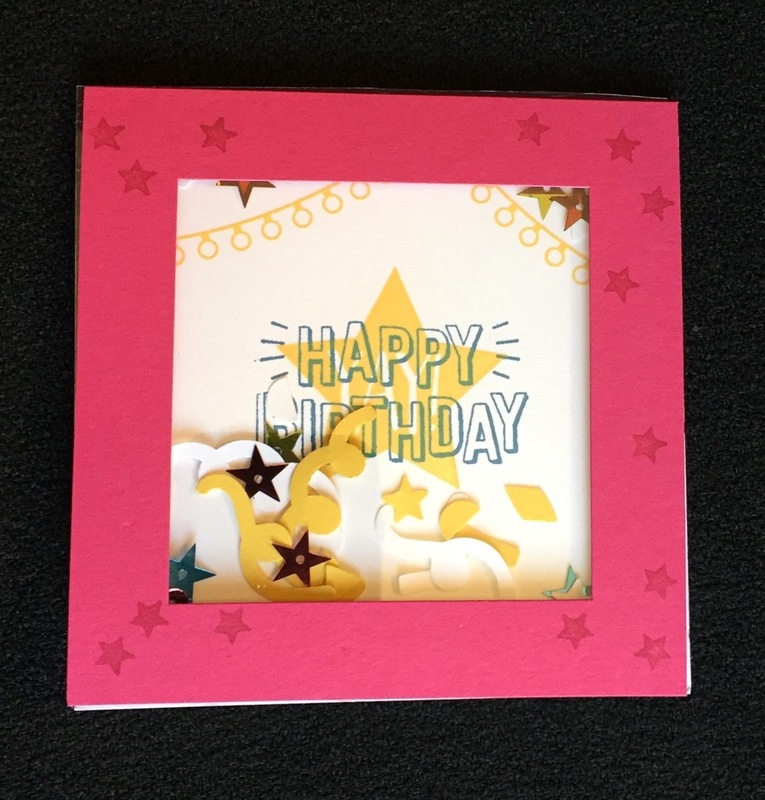 The first is the Festive Birthday suite featuring the "Birthday Fiesta" set with its matching Framelits and gorgeous Festive Birthday Designer Series Paper. Lookie!! Did you see that cutie-patootie llama?! He's so fun!! 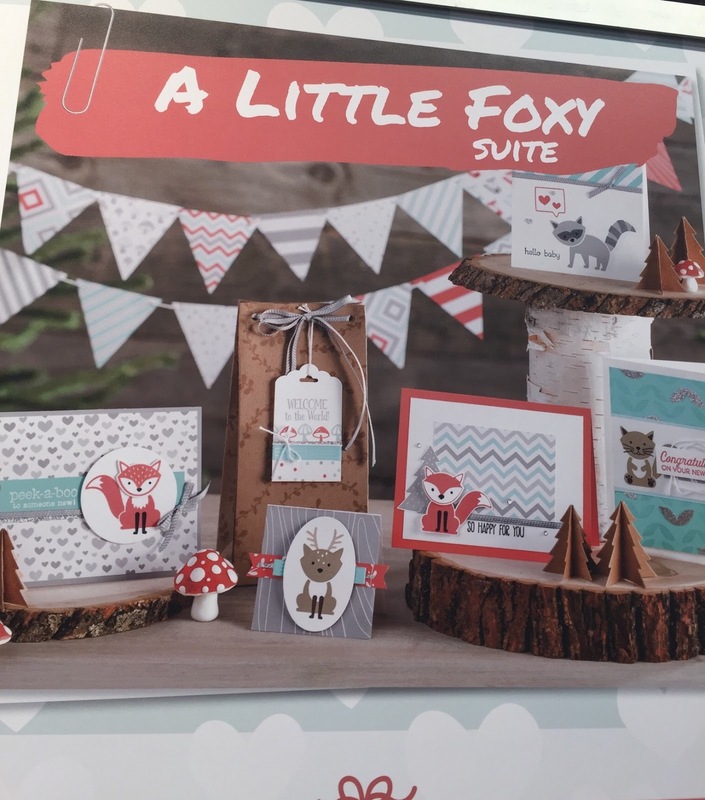 But my most favorite of all the product suites is the "A Little Foxy" suite featuring the "Foxy Frinds" photopolymer stamp set and the Fox Builder Punch and super cute A Little Foxy DSP. Isn't this cute?! 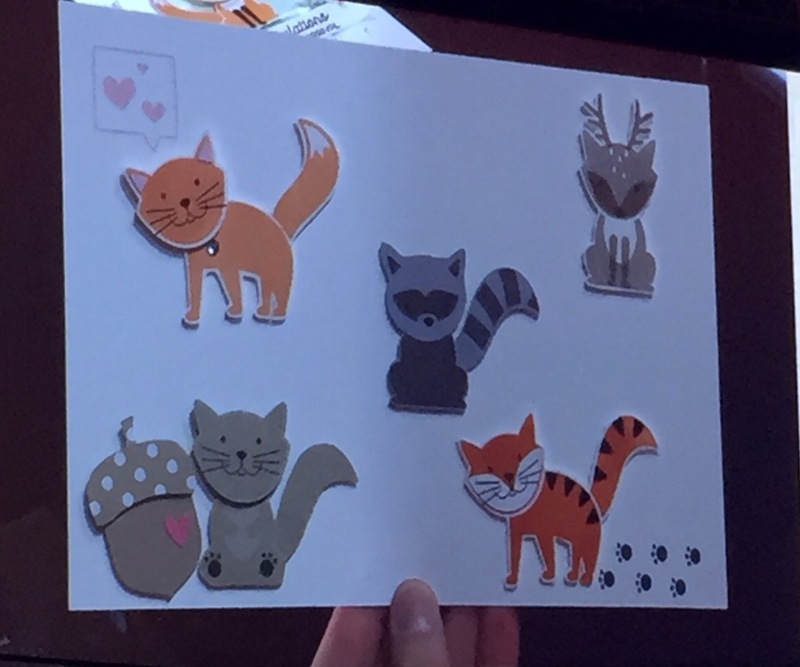 And not only that, but with this stamp set and builder punch (sold in a bundle for a 10% savings) you can make a whole collection of super cute animals. They're so adorable!! Both these stamp sets and coordinating product will be in my first order when the catalog goes live. 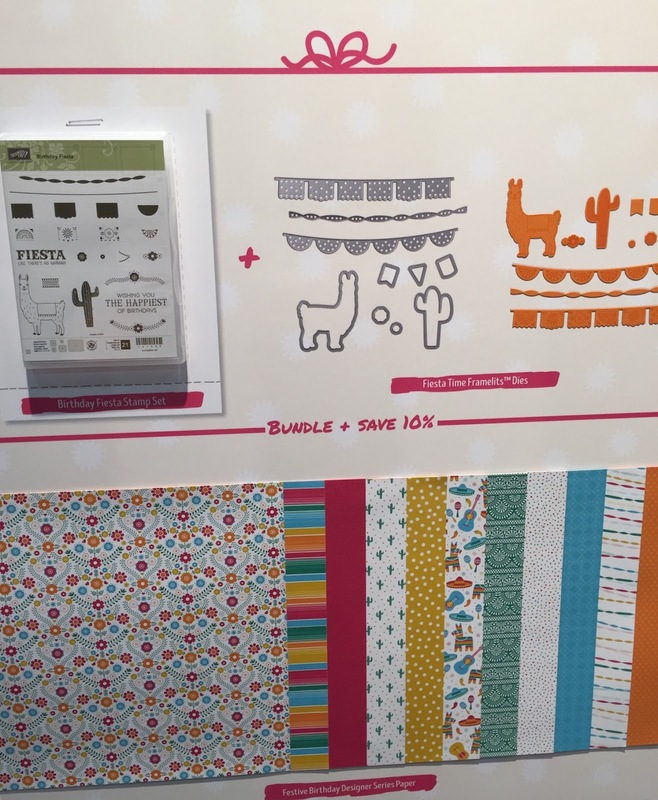 Wouldn't you like to host a party and make some cute projects with them? Contact me and we'll set up a date!! 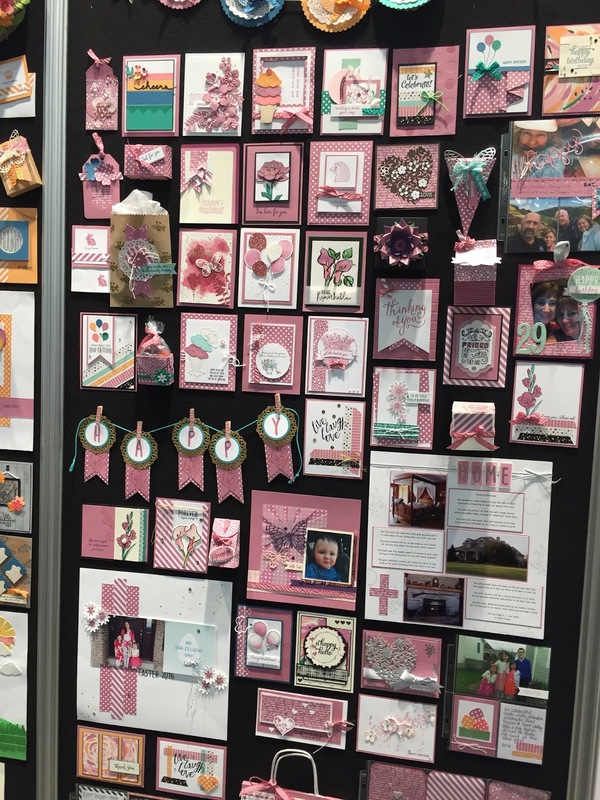 #stampinup #onstage2016 The Affectionately Yours product suite in the upcoming catalog is full of flowery, coppery goodness! 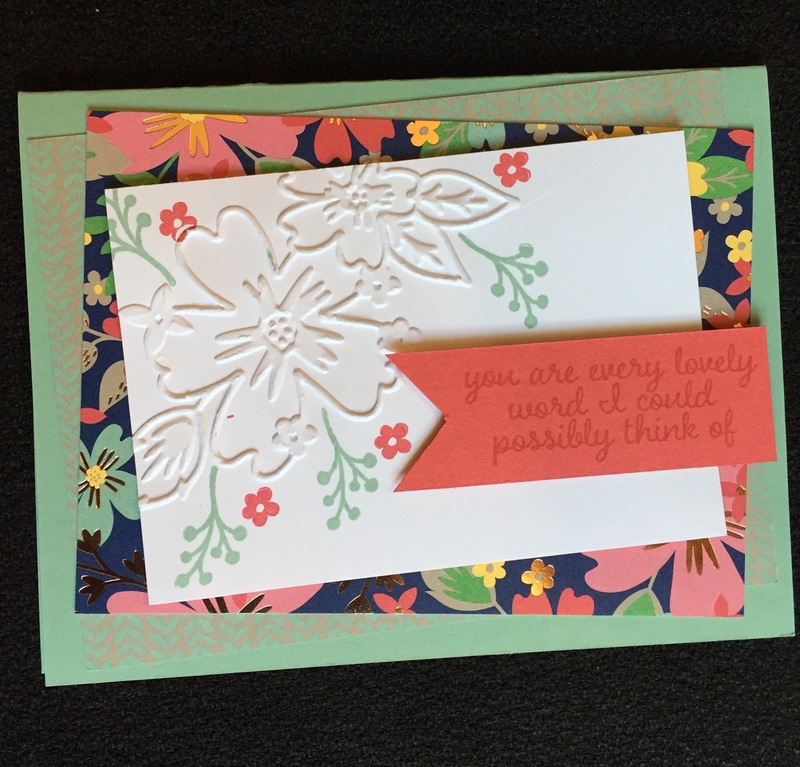 For this make and take, we used the "Love and Affection" photopolymer stamp set, the Affectionately Yours Specialty Series Paper, and one of the Floral Affection Embossing Folders. This is such a sweet suite! Here's a sampler of the Affectionately Yours DSP. Look at the awesome copper woven through two of the sheets. Love it! And here are some other samples made from this product suite. #stampinup #onstage2016 There's a sweet new birthday set in Stampin' Up's new catalog called "Confetti Celebration." It coordinates with the Confetti embossing folder from the Occasions catalog (which is carrying over) and there's a new Sprinkles confetti punch, too! 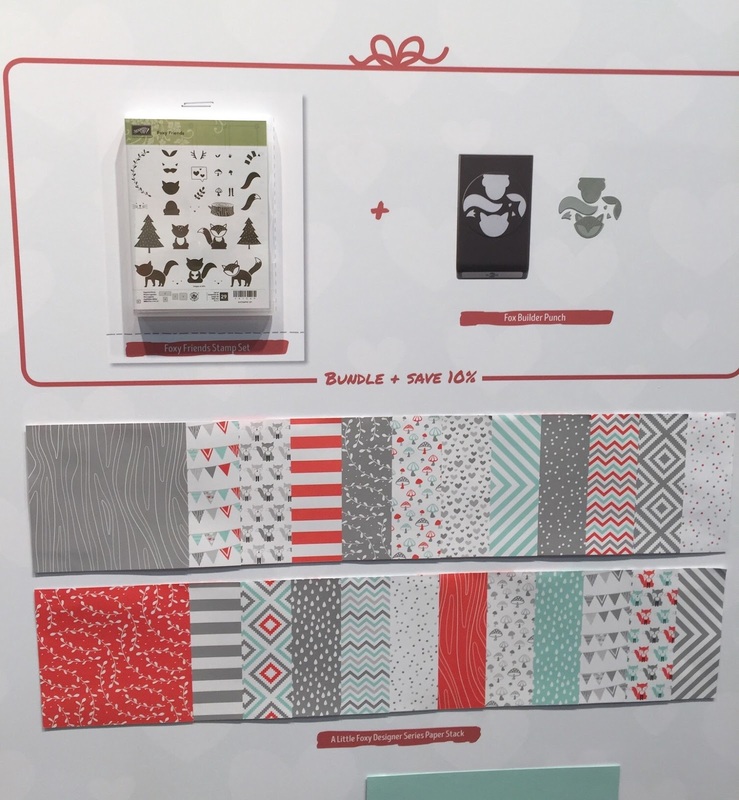 Also, new are the Foam Adhesive Strips--perfect for making shaker cards! We made a cute shaker card using these products at OnStage Live! Here it is! Isn't is fab?!! 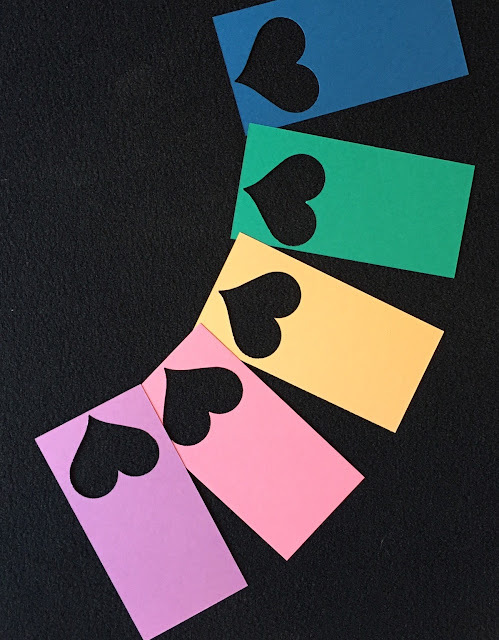 Here's another shaker card using the same set. This one was on the display boards. It's totes adorbs, too, don't you think? Come back tomorrow for another cute project using new goodies from the new catalog. 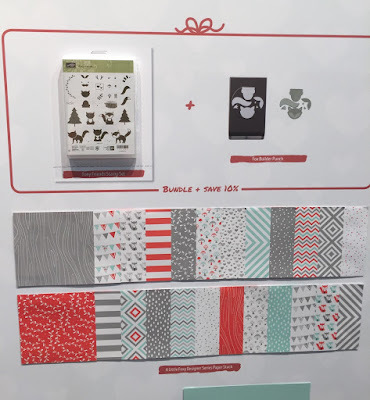 #stampinup #onstage 2016 The new Stampin' Up catalog has a ton of kits. 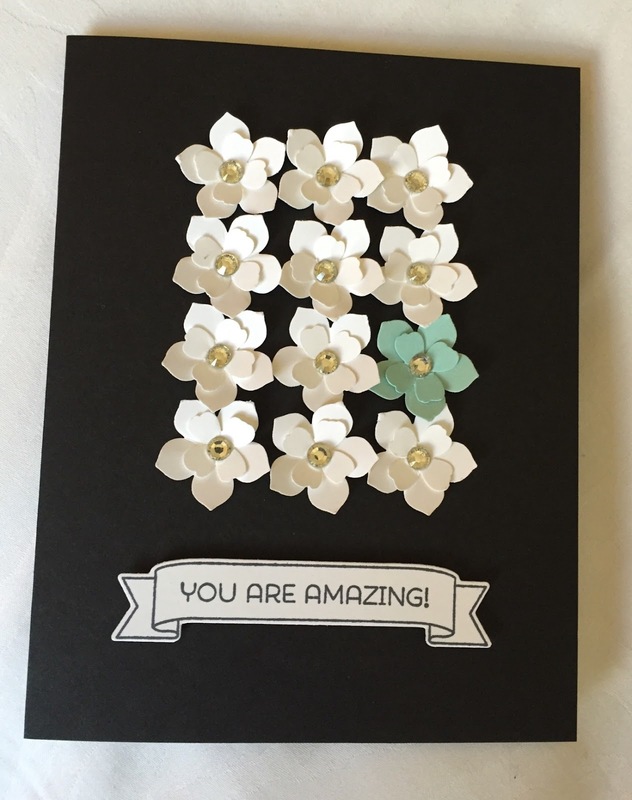 Kits are great for people who want to create beautiful cards for all occasions but who don't want to invest in a lot of supplies. Kits are also great for seasoned stampers because we can always step up the designs and use the supplies to make something new and exciting. There's a new all-inclusive kit I the upcoming catalog. 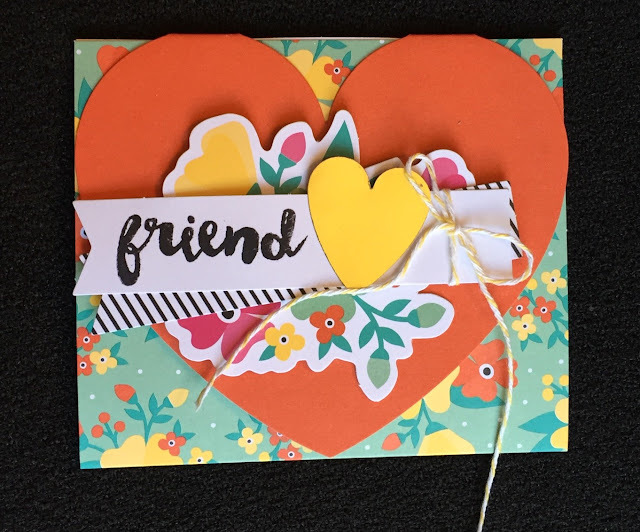 It has everything you need to make 20 cards--an ink spot, embellishments, envelopes, an acrylic block and a stamp set only available in the kit. It's awesomeness! During On Stage Live, we got to make one of the cards and it's adorable. This picture doesn't do it justice. You'll have to take my word for it--until you can get your hands on our own kit. This would be a fun activity for a girls night out!! Contact me and we'll set up your get-together as soon as the we catalog goes live! The OnStage Live presenter also made some stepped up cards and shared them on one of the display boards. Here's a sneak peek at the kit and some of the modified cards. I'm loving this kit and I know you will, too!! 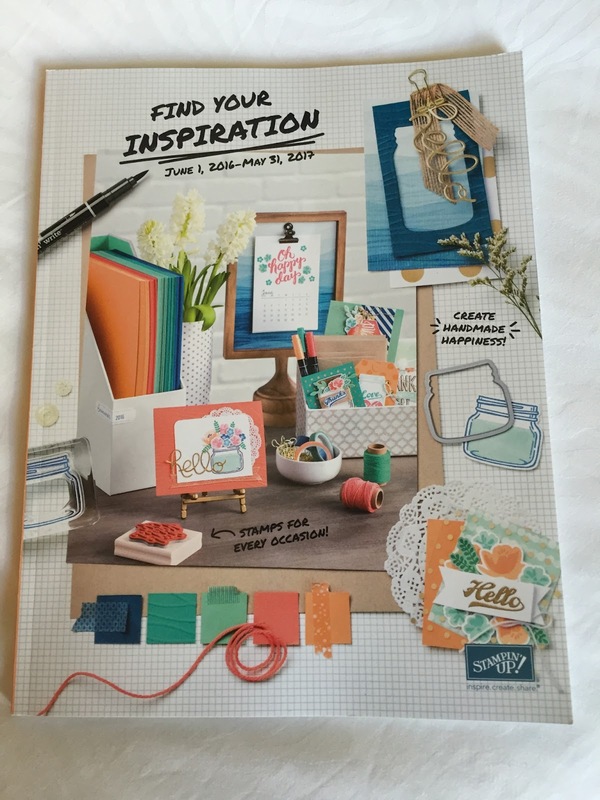 #onstage2016 #stampinup I can finally reveal the front cover of the NEW Stampin' Up catalog. Since Stampin' Up didn't tease us and make us wait while we were at OnStage Live, I won't make you wait either. Here it is!!! Unfortunately, I can't show you the inside of the catalog, but I can share the new In Colors and some of the projects we created with the new products! Today's post will be all about the In Colors. Each day this week, I'll share photos of projects I made with some of the new stamp sets. 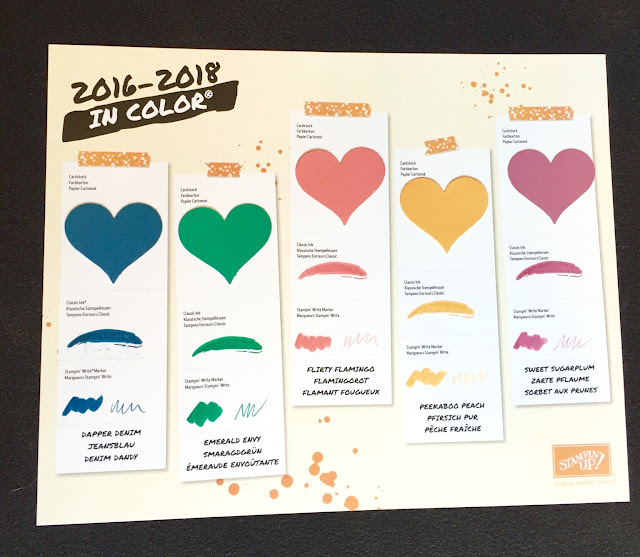 Drum roll, please...the new In Colors are Dapper Denim, Emerald Envy, Flirty Flamingo, Peekaboo Peach, and Sweet Sugarplum. Here's the color swatch project we made and the card stock pieces. I also took pictures of the display boards--I thought I'd taken pictures of all five of them, but apparently I can't count! 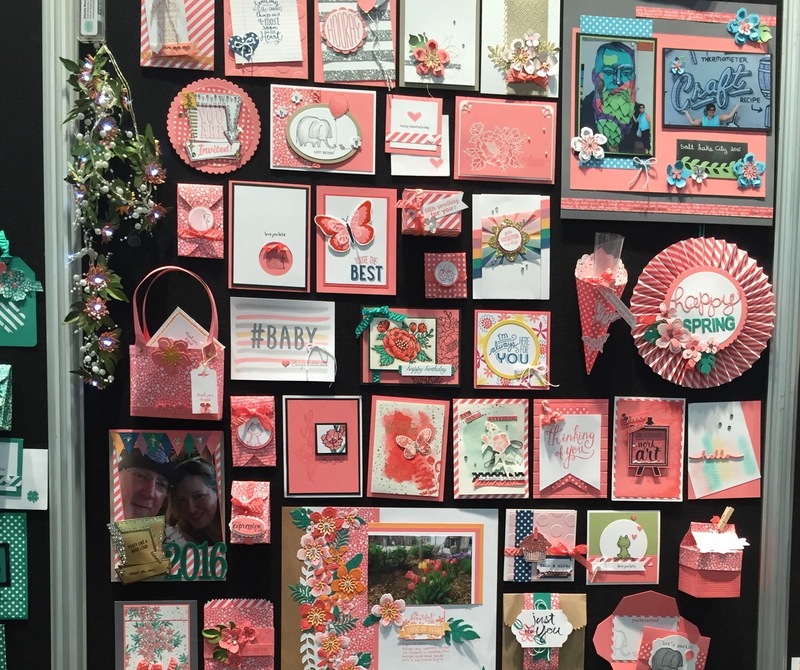 You can see just a little bit of Emerald Envy peeking out to the left of the Flirty Flamingo board and a tiny bit of Peekaboo Peach to the left of the Sweet Sugarplum board. Look closely and you'll be able to see some of the new stamp sets, too! Enjoy! #stampinup #onstage2016 I think I've finally figured out how to blog AND upload pictures using my iPad, so I'm going to be able to share some of my experience at the OnStage Live event in Salt Lake City. Next week I'll be sharing the front cover of the catalog and our make and take projects. Be sure the check back everyday!! I was greeted at the hotel with a welcome from Stampin' Up. The businesses in the neighborhood also sport signs welcoming demonstrators. There are flags flying in front of the Salt Palace Convention Center, too. The convention center is always decorated wonderfully. We demonstrators always get a warm and colorful welcome!! 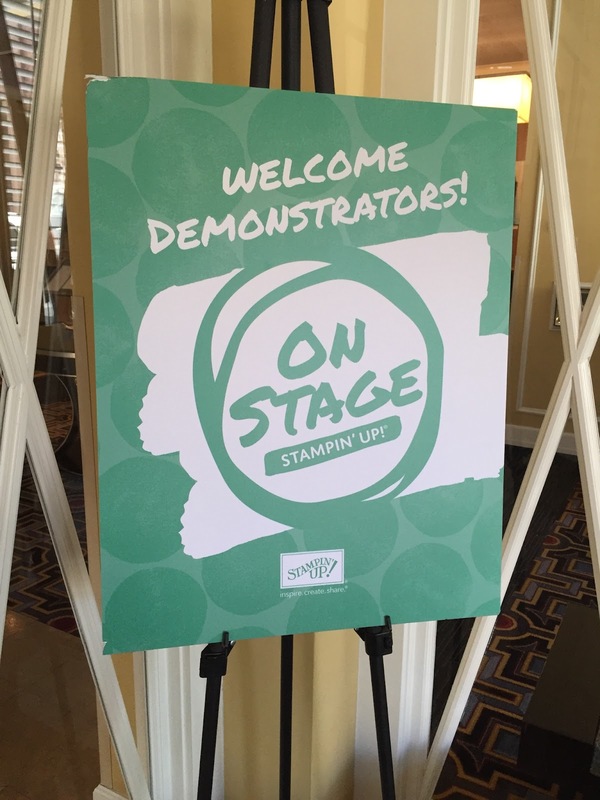 Thursday was the first day of Stampin' Up's OnStage event and boy did they pack a lot of fun into a few hours!! We had a live band opening the show. They were awesome!! 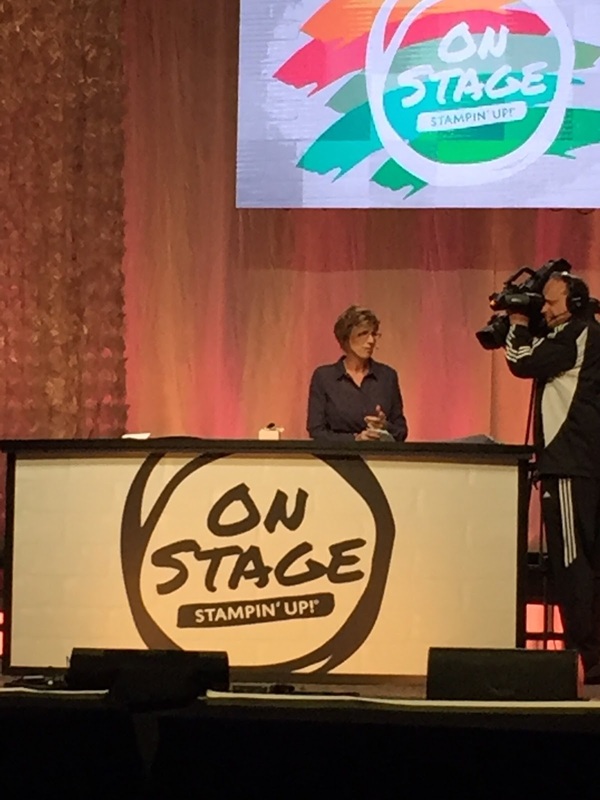 Stampin' Up's new CEO, Sara Douglass, came out to open the session and was soon joined by her mom, Stampin' Up Founder, Shelli Gardner. It was quite the emotional moment--as usual! Shelli treated us to a stamping demonstration using NEW product (squee)! 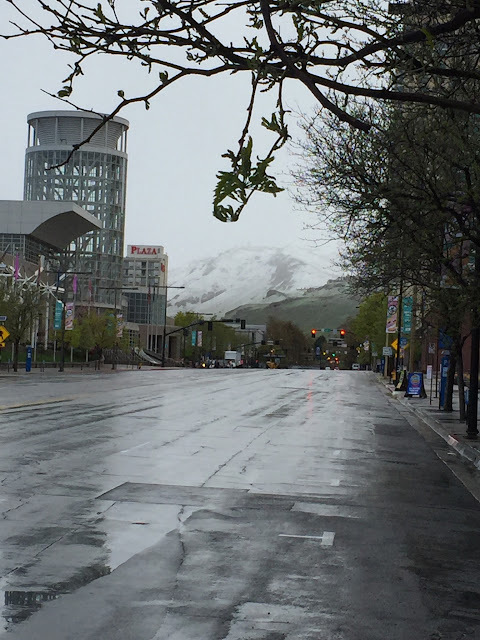 On Friday morning, we were greeted by a bit of snow. The mountains were covered. I was thrilled to see the snow on the mountains. Salt Lake City is so beautiful! We also had two sessions where we saw more demonstrations of MORE new products from the new catalog and even got to get our hands in the new stuff during our Product Playground sessions. 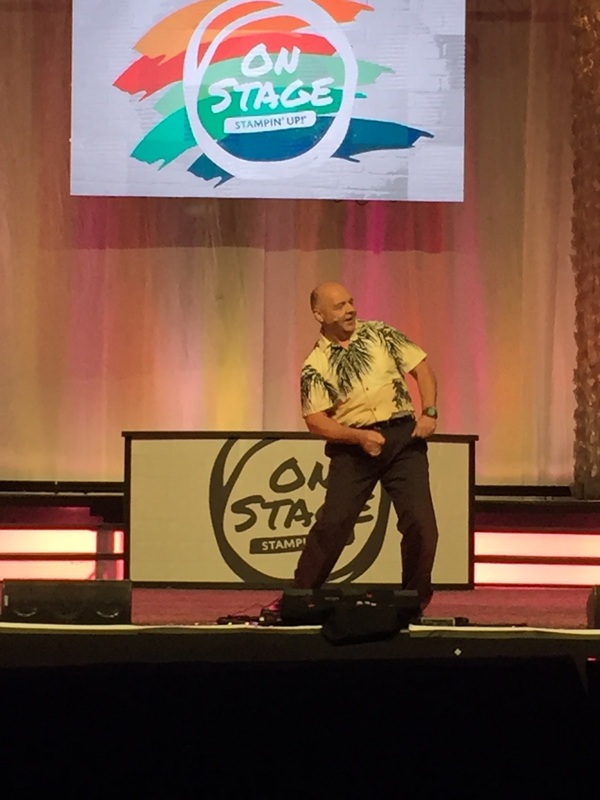 Friday's highlight, for me, was when Dale Hampshire, Stampin' Up Canada's General Manager, opened the afternoon session with a dance number. So cute!!! Saturday's highlight was when Sara and Shelli shared their favorite sets from the catalog and then switched it up--Shelli had to use Sara's favorite sets, and vice versa. Their mother-daughter banter had us all in stitches! I received a new set during a Prize Patrol and everyone received an additional set during an all-attendee giveaway!! 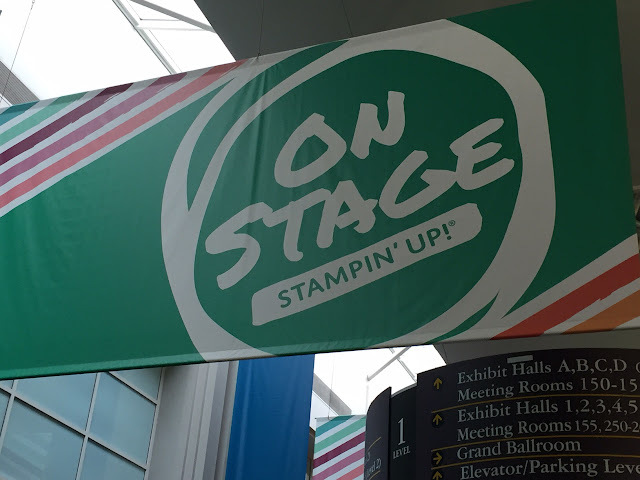 I had a great time at OnStage Live--stamping and catching up with friends!! I can't wait until the next event in November! #stampinup #hardinguniversity Yesterday I shared a more feminine version of this thank you card for my 16-year-old daughter to send to her host as thanks for sharing her dorm room with her when she visited Harding University. Today's version is the masculine version for her twin brother to send to his host. For this card, I started with a scrap of Whisper White (you could use any color), cut to 3-1/8" x 2". I punched three different designs from the Going Places 6"x6" Designer Series Paper stack with the Washi Label Punch. I stamped a sentiment from the "One Big Meaning" stamp set onto a Very Vanilla scrap in Basic Black Archival Ink and punched it out with the Washi Label Punch. I adhered these to the scrap and then adhered them to an Lost Lagoon mat, cut just larger. I used Stampin' Dimensionals to adhere the Washi Label assembly to another piece of Going Places DSP. I unraveled a length of Melon Mambo/Basic Black Baker's Twine to get just the Basic Black and then wrapped this around the pieces before adhering them to a Very Vanilla mat. I tied a knot through a gold Basic Metal Button and adhered it to the card with Glue Dots. Finally, everything is adhered to a Mossy Meadow card base. This is a quick card and it's a good way to use up some of your scraps of DSP. Go back one day to see the more feminine version of this card.